We all love coming across a touching book that just speaks to us, and this week, I grabbed one at my favorite discount bookstore, Ollie's (Good Stuff Cheap). If you haven't heard of Ollie's, then your pocketbook thanks you! Seriously, every single time I walk in, I leave with a handful. BUT...I do use each and every one. Promise! Anyway, I want to share how I used this treasure to teach memoir writing to my students. I love sharing new books I find especially when they're new ones from a favorite author. Lately, I have been on an Eve Bunting kick, so this one had me smiling when I saw it on the shelf. The cover drew me in with the sweet child holding an antique necklace. Reminded me of rummaging through my grandma's costume jewelry when I was young. You can see what I means with the cover, right? Well, ironically, we are teaching memoirs and even though I had this book, it didn't pop in mind when I was doing my plans. I had planned to use the book, Memoirs of a Goldfish for the introduction. I had all of my plans ready, went in the library to pull the book this morning, and man, it was checked out! What does a teacher do? Well, after a bit of juggling in my brain, it hit me that I had this gem sitting down in my room. Perfect! 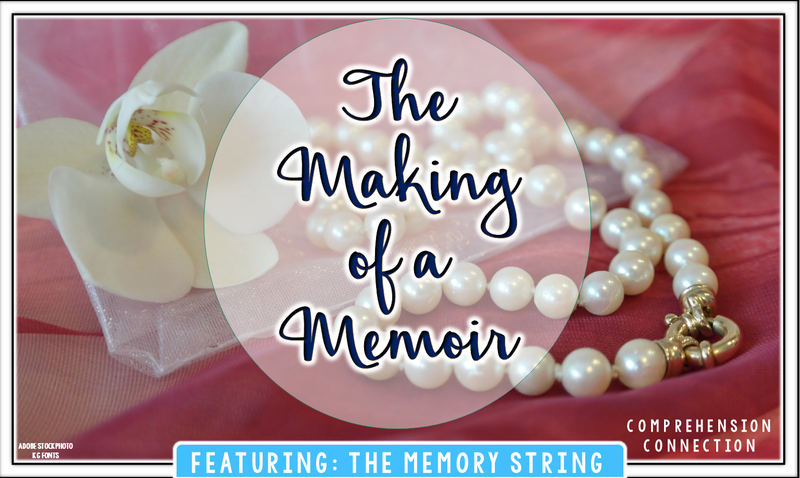 I knew The Memory String would work well for memoirs, making connections, or theme. Ironically, we're studying theme this week as well, so I actually made use of this book for two purposes. Yeah! With my group, I shared it as a read aloud pausing and questioning, pointing out the way the author developed the small moment, and how the words were carefully selected to create imagery. Truly, worked perfectly. Each button on Laura’s memory string represents a piece of her family history. The buttons Laura cherishes the most belonged to her mother—a button from her prom dress, a white one off her wedding dress, and a single small button from the nightgown she was wearing on the day she died. When the string breaks, Laura’s new stepmother, Jane, is there to comfort Laura and search for a missing button, just as Laura’s mother would have done. But it’s not the same—Jane isn’t Mom. 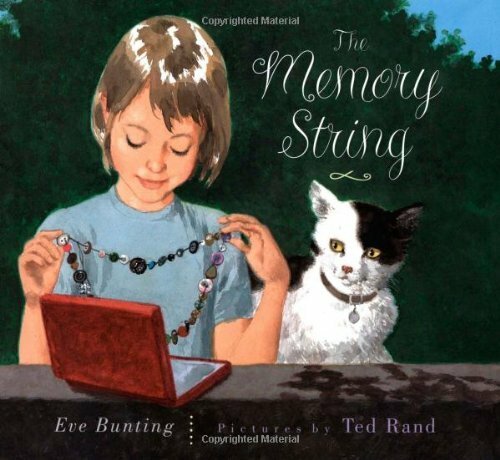 In Eve Bunting’s moving story, beautifully illustrated by Ted Rand, Laura discovers that a memory string is not just for remembering the past: it’s also for recording new memories. If you are introducing more than one Eve Bunting book, this video clip of her may come in handy. Students love to hear where the story ideas originated, and this clip is not too long. I truly enjoyed this story, and the children did too. We stopped during our reading periodically to discuss the book, how the author expressed the memories, word used, story elements, and all students were anxious to get to the end so they could write! Analyzing memoirs helps students recognize the format that memoirs follow, and students see that memoirs focus on small moments in time rather than a lifetime. They noticed that it had a clear beginning, middle, and end. 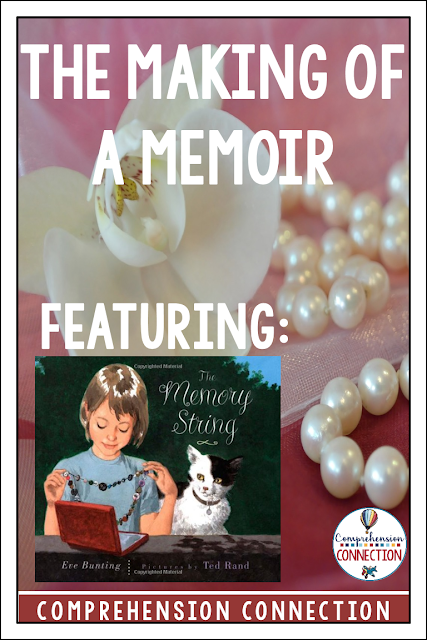 Writing memoirs with your students can be a great way to reflect on previous memories and celebrate the great things about each and every child. This freebie I put together might help you get started. My students' finished pieces were very special. One even made tear up a little. I hope you experience the same. I love Eve Bunting and this video clip! Thank you for sharing it! Thanks for dropping by Susanna! I'm really glad you like the freebie. We had fun writing our memoirs, and they turned out very nice.